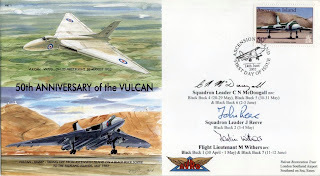 Cover signed by all three Captain's from the Vulcan Black Buck Missons 1-7.Sqn Ldr Neil McDougall, Sqn Ldr John Reeve and Flt Lt Martin Withers. Three 22-year old Avro Vulcans B2s were deployed to Wideawake airfield on Ascension Island, which were drawn from No. 44, 50 and No. 101 Squadron RAF. The Vulcans were captained by Squadron Leader Neil McDougall, Squadron Leader John Reeve and Flight Lieutenant Martin Withers. The first 'Black Buck' mission was flown against the runway at Port Stanley airfield, the intention being to deny its use to the Argentinean high performance fighters using high explosive bombs. A stream of eleven Victors and two Vulcans took off just before midnight, with Vulcan XM598 (Squadron Leader John Reeve and crew) designated as the primary strike aircraft and XM607 (Flight Lieutenant Martin Withers and crew) in reserve. However, soon after take-off John Reeve had problems pressurising XM598's cabin and was forced to return to Ascension, leaving Martin Withers and XM607 to complete the sortie. The Victors split into three waves flying at their economic cruise height of 27,000 feet. As the force headed south, some Victors tanked other Victors, whilst others topped-up the Vulcan. At each refuelling, the crews had to ensure each aircraft had enough fuel to return to Ascension or to reach the return leg rendezvous. The Vulcan flew at 33,000 feet, below its economic cruise height, but where it could keep in visual contact with the Victors below. It descended to meet the Victors at each refuelling bracket, climbing back to height afterwards. 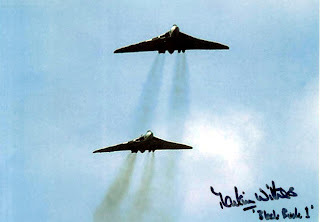 As the formation got nearer to the Falklands, it decreased in size until only two Victors and the Vulcan were left. Trouble then struck. As one Victor was transferring fuel to the other, the pair encountered strong turbulence, which caused the probe on the receiving aircraft to break. This meant the Victor had to recover direct to Ascension as it could not take on any more fuel. With the success of the mission hanging in the balance, the second Victor XL189, flown by Squadron Leader Bob Tuxford and crew, took back the fuel it had just transferred and headed on alone with XM607. All was not well aboard the Vulcan either. Its high operating weights had meant it had used up more fuel than anticipated and at the last outward 'prod' north of the Falklands, Bob Tuxford and crew gave over more fuel than planned to make sure XM607 could complete the mission. This left the Victor short of fuel, so much so that unless it could get tanked-up on the return leg, it would ditch approximately 400nm short of Ascension. However, until the code-word was broadcast indicating the Vulcan had hit its target, Bob Tuxford could not break the radio silence to request tanker support. For giving the Vulcan the chance to complete the mission successfully, Bob Tuxford was awarded the Air Force Cross. Back on the Vulcan, Martin Withers took XM607 down to 300 feet as he approached the Falklands to avoid detection by Argentinean radar. 40nm from its target, XM607 climbed to 10,000 feet for a straight-in bombing run on Port Stanley airfield. The 21 one thousand pound HE bombs were dropped diagonally across the airfield, a single bomb cratering the runway halfway down its length and the remainder causing havoc amongst the parked aircraft and stores. The code-word 'Superfuse' was then broadcast and XM607 climbed away, landing back at Ascension 15¾ hours after take off. For this important flight, fraught with potential hazards beyond enemy action, Martin Withers was awarded the Distinguished Flying Cross. John Reeve and crew flew XM607 armed with 21 one thousand pound HE bombs on a similar mission to 'Black Buck' 1. The lessons learned from the first mission regarding fuel consumption were put to good use and, although no further hits were scored on the Port Stanley runway, peripheral areas, parked aircraft and stores all suffered damage. The third 'Black Buck' was cancelled due to poor weather. 'Black Buck' 4, on the night of 28-29 May, saw the RAF move away from HE bomb attacks to using the AGM-45A Shrike anti-radiation missiles against the Argentinean radar sites around Port Stanley. Vulcan XM597, flown by Squadron Leader Neil McDougall and crew, was the strike aircraft for the mission but was forced to return to Ascension five hours after take-off when the lead Victor's refuelling drogue failed. For 'Black Buck' 5, Neil McDougall and crew set out again to attack Argentinean radars, this time in a mission coordinated with Harrier strike on the islands. The Shrike missiles were carried externally on pylons. This freed up the Vulcan's bomb bay to hold two additional fuel tanks, reducing the amount of Victor tanker support required. As the Harriers attacked Port Stanley airfield, Neil McDougall and crew loitered at a safe distance waiting for the radar sites to transmit. It was a game of 'cat and mouse', the Shrikes were eventually launched causing limited damage to one radar site. Neil McDougall and crew again took a Shrike-armed XM597 to attack Argentinean radars. The Vulcan ran in at 300 feet before pulling up to height 25nm from the islands. As it did so, the Argentinean's switched off their main air defence radar. XM597 was forced to prowl around, hoping the radar would be switched on again long enough for the Shrikes to be locked-on and launched. After some 40 minutes, a lock-on was achieved and two Shrikes sent on their way, destroying a radar that had been acting as fire control for a number of anti-aircraft batteries. Trouble ensued on the return leg at the final refuelling 'prod'. As the Vulcan moved its probe into the Victor drogue, for no apparent reason it broke, spraying fuel all over the Vulcan's windscreen. With no hope of taking on more fuel, or making it back to Ascension, Neil McDougall set course for the only possible diversion - Rio de Janeiro. The crew jettisoned classified material over the South Atlantic and, with their fuel situation critical, made contact with Rio air traffic control on the distress frequency. The Vulcan was kept high for fuel economy and made a steep, straight-in approach into Rio's Galeao Airport, landing in the wrong direction on the inactive runway. After seven days, the Vulcan and its crew were allowed to leave, on the proviso that XM597 played no further part in the conflict. For his pioneering missile attacks, Neil McDougall was awarded the Distinguished Flying Cross. The final 'Black Buck' mission saw a return to direct attacks on Port Stanley airfield. With no further strikes required on the runway, XM607 with Martin Withers and crew attacked equipment on the airfield with a mix of 'iron' and anti-personnel bombs. A number of hits were scored and XM607 returned safely to Ascension.